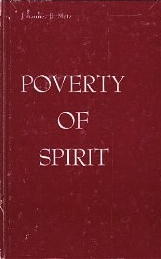 Johannes Metz’s Poverty of Spirit, published in 1968, develops a rich portrait of the contingent human condition as most fully revealed in Jesus. In striking contrast to some contemporary theological anthropologies that seem founded primarily on human sinfulness, Metz roots his approach in incarnation. This Christocentrism constitutes the greatest strength of Metz’s presentation. According to Metz, in Christ we see the fullest expression of human existence. As the prototype human, Jesus manifests equally the heights and depths of human nature: “Christ, the sinless one, experienced the poverty of human existence more deeply and more excruciatingly than any other person could” (13). Metz finds in the temptation scene a witness to the fidelity of Christ to the limitations of human existence. In refusing Satan’s offer of inhuman “strength, security and spiritual abundance” Jesus refuses to grasp for equality with God (11). This willing submission to weakness, vulnerability and spiritual hunger is prescriptive. The greatest weakness of Metz’s presentation is his unfortunate choice of the term “poverty” to express the fundamental human condition which, when embraced, becomes the site where heaven meets earth (21). Taken from the first of the beatitudes, Metz follows millennia of interpreters in what Dallas Willard in The Divine Conspiracy understands to be a mistake. Metz regards poverty of spirit not only as a virtue, but as “the ground of every “theological virtue,””(45) including those dispositions that follow. Within the broader message of Jesus concerning the Kingdom of God, Willard construes the beatitudes as the conditions of those at the farthest reach of the Kingdom. Thus poverty of spirit is noted not as a virtue to be sought but in order to announce that even the spiritually bankrupt can receive the Kingdom. In closer keeping with a key text that animates Metz understanding of Jesus’ embrace of the human condition (Phil. 2:5-11), I suggest the language of “obedience.” Obedience includes the notion that one must live within rightful limits. Metz makes hints in this direction noting that Jesus resisted temptation in “obedient acceptance of our natural impoverishment” thus we are called to “obediently accept our innate poverty ” (19, 28). Unlike “poverty”, which connotes tragic emptiness, “obedience” indicates a fulfilling humility—which, closer to Metz’s intention. Though nothing could be more natural, living in obedience to our innate poverty of spirit is not, in our day and age (or, for that matter, any), typical. This humble posture toward life goes with the grain of our nature, but against the grain of society. Satan’s earliest promise still seduces humanity: “You will be like God”. Postmodern philosophies explicitly strive to dislocate any ultimate “ground of Being” which appears as a tether on human potentiality. Even our churches too often fail to welcome us to embrace our human poverty. Some woo us into the other-worldly ecstasy of seeing God face-to-face in a moment of song, thus inciting us to claim spiritual wealth rather than the spiritual humility that seeks God in the face of neighbor. For “anyone who does not love his brother, whom he has seen, cannot love God, whom he has not seen” (1 Jn 4:12, NIV). In our poverty we confess that we have not seen God. In our churches, we often declare clarity rather than confessing our human horizons. Those of our churches that do call for humility, too often present it as a subtle technique for divine control. If we will be humble ourselves, we will be richly rewarded, they promise. This is not poverty of spirit, but a veiled grasp for strength. In view of the challenges posed to those seeking what Metz calls “poverty of Spirit” or I have rendered “obedience” to human nature, spiritual practices are seen for their great significance. Metz highlights the potency of worship and prayer for the cultivation of humility: “Only prayer reveals the precipitous depths of our poverty…In prayer we drink the dregs of our poverty” (51). While Metz speaks of prayer generally as a key practice, he gives little practical guidance regarding how this prayer might be approached. Of the twenty-one varieties of prayer described by Richard Foster in Prayer, I believe the Prayer of Examen might be particularly useful for cultivating poverty of spirit. While Examen can take many forms it typically centers on an evening period of prayerful remembrance of the day. Particular attention is given to attempting to notice both when one experienced the nearness and activity of God and when felt farthest from or least connected to God. This simple practice provides an occasion for both praise for God’s nearness and confession regarding disconnection. Both these moment in prayer are rich opportunities to cultivate poverty of spirit. As Metz’ notes, “In worship we hand over even our poverty and pledge it to this mystery of God’s all-encompassing presence” which Examen attunes one to (51). While poverty of spirit is not synonymous with human sinfulness, sin is often the result of ones rebellion against or fear of human limitation (13). A practice of regular confession such as the Examen facilitates can, therefore, habituate one in the humble submission which constitutes poverty of spirit.